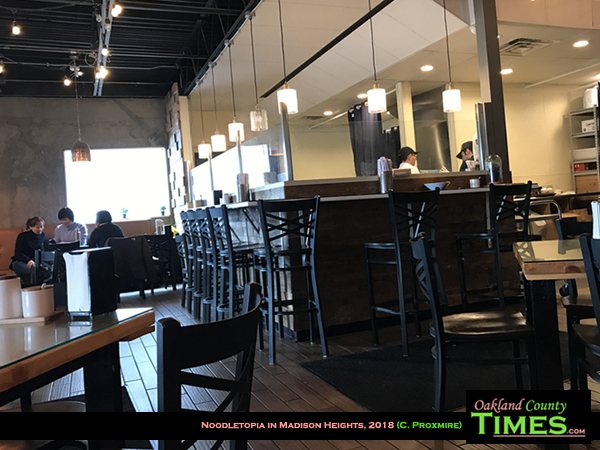 Madison Heights, MI – If you are looking for a meal of authentic Chinese hand made noodles, there is a place called Noodletopia at 30120 John R. in Madison Heights. 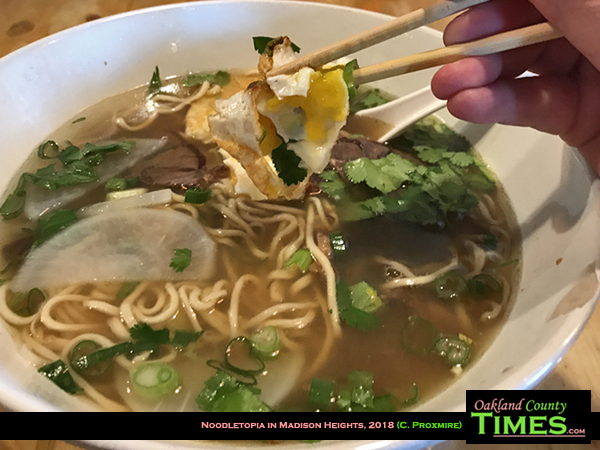 Noodletopia’s menu is refreshingly simple – with basic noodle dishes and the option to add in items. 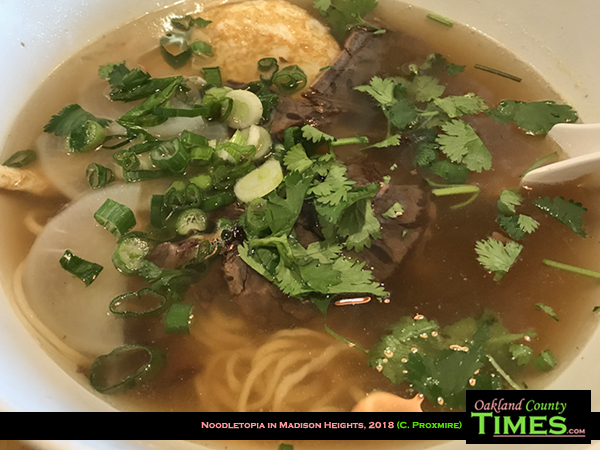 I ordered the hand pulled beef noodle which came with beef shank slices, white radish, cilantro and green onions in a beef broth, with a fried egg added on. I learned that beef shank comes from the leg of cows, and that it is tougher than other cuts. It was sliced thin and seemed a perfect fit for this dish. I also learned the Noodletopia hand makes their noodles fresh onsite, in view of their guests. 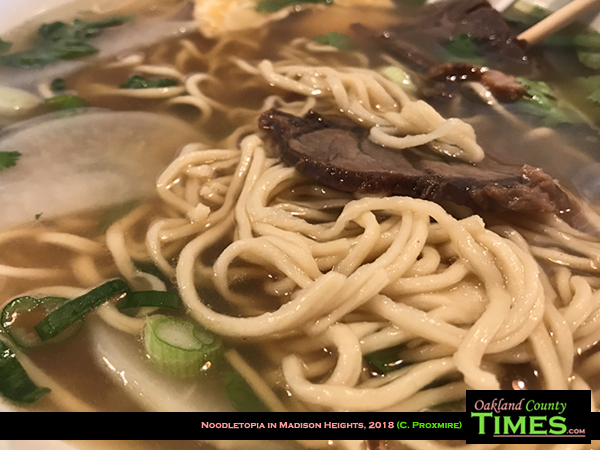 The difference in quality is noticeable, with these house-made noodles being more hearty than those that simply come in a box waiting to be boiled. 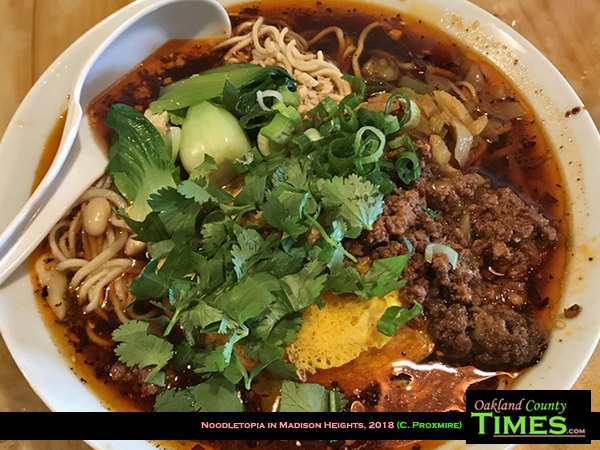 I was there for a meeting, and my fellow diner had the Szechuan noodle which included ground pork, soybeans, garlic, peanuts, Sichuan pickle, green veggie, cilantro, green onion and sesame in a beef broth. This was spicy enough to make their face turn red and sweat when they ate it, which I’m told is a good thing. 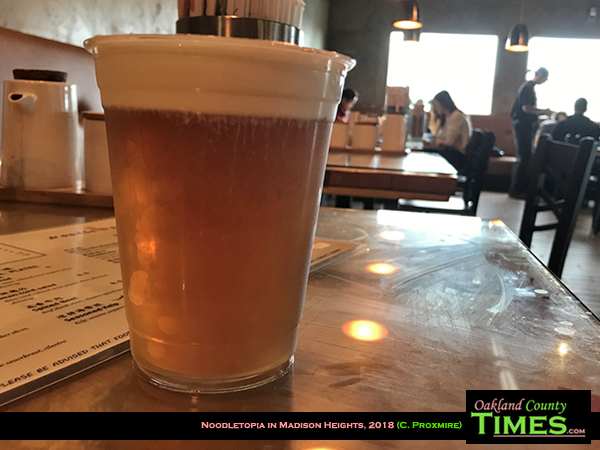 Another item on the menu caught my eye – Sea Salt Cheese Tea. This is chilled black tea with a sweet and salty layer of foam made with cream cheese, cream and salt. Stirred together makes for a creamy and delicious take on tea that I’m already missing.